Put the words “bio” and “dynamic” in front of an apple and tell me that the first image into your mind isn’t one of a fleshy, mutant-red ball of energy. I’m thinking something with a cape that can leap off tall buildings. That can self-replenish itself and save me from regular trips to the doctor. Am I right, I ask, am I right? Well, no, not really. I mean, if I was to create a graphic novel, the Biodynamic Braeburn would be the right kind of a hero (or even a villain if I gave it a mustache). 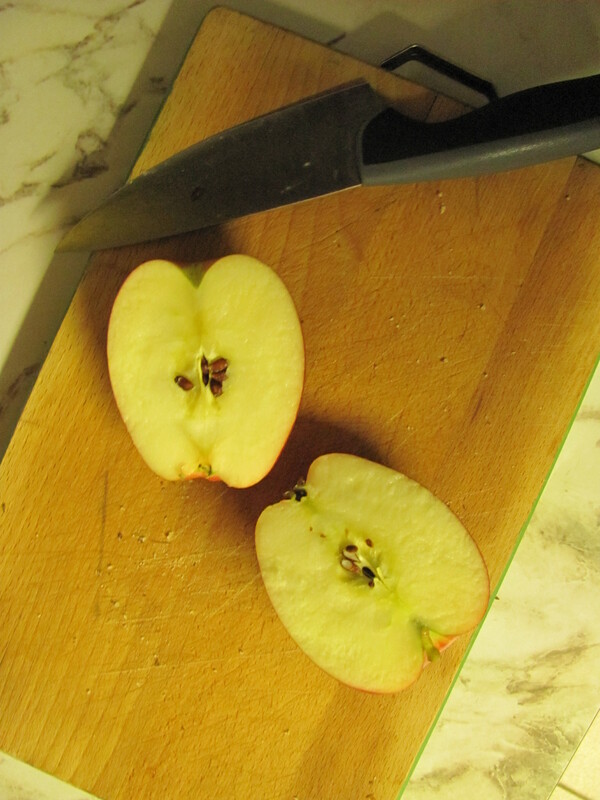 But in this case, I put down my Pilot pen and picked up the utility knife for a new kind of apple. You see, this is no ordinarily-grown apple. “Biodynamic” is a sustainable farming system that goes beyond the organic, holistic methods of manures, composts and no chemicals, and will actually follow an astronomical sowing and planting calendar. That means, this apple was grown according to the stars! I cup it in my hand, barely managing a grip on the mass of it. “What kind is it?” I inquire. Now, you can’t just make that kind of remark without reason. I opened the car door with my new gift and promised Amy a thorough review and comparative opinion. Once inside my apartment I set the apple on my kitchen counter, it radiating its health amongst my browning bananas and bowl of Golden Auroras I’d picked up from Davison Orchards at Thanksgiving. 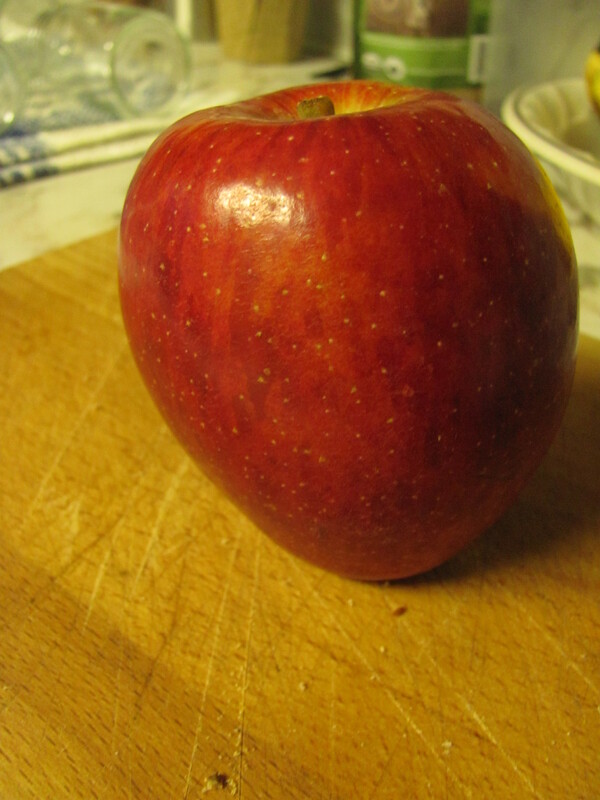 My standard market fruit, my common nutrients, were aweing in the Braeburn’s shadows. This fruit, I silently declared, deserves a special consumption. A proper chop and dice, when my palette was fresh and no other flavour had hit my tongue in 8+ hours. Yes, indeed, this Braeburn would be tomorrow’s breakfast. I woke at 7:30am and had to double-check my alarm clock radio with my phone because the sky was still so dark. Our system of ‘keeping’ time says “Wake!” despite the body’s preference to hibernate. But I was soon snapped out of my grizzly state. “The Biodynamic Braeburn!” I exclaimed and bounced out of bed. This would be a morning of firsts. There it still was, looming at me with that red skin, bolding me down as its inferior. I sliced it with a satisfying chop of the knife and removed the core. I couldn’t even sit down at the table — the anticipation had me perched at the edge of my counter! Oh, the tartness, forcing me to sip on water between bites! Oh, the crispiness, the acoustic crunch produced as I masticated away! And the juice, oh so juicy, making me lick my fingers as it ran away. Each area of the apple seemed to be a slightly different degree of tart-sweet ratio. The skin – bitter. Immediately beneath – slightly sweeter. And it’s texture – papery? I diced half the remaining fruit into my breakfast (a slop of banana, Kashi cereal, cottage cheese, yogurt and milk). I’m not normally keen on Braeburns. I’m more of a Spartan- or Ambrosia-type of girl. Crisp but sweet, is how I like it. Yet the immense tartness of this biodynamic gem blended well with the natural sweetness of the dairy and banana.